Local First Arizona has now released the third edition of the Scottsdale Small Wonders Map, a pocket-sized guide featuring over thirty local restaurants, galleries, boutiques, venues, and experiences located in Scottsdale. All of the businesses included in the guide are independently owned and operated. “We created the Small Wonders map series to help Arizona residents and visitors find the unique local businesses in their neighborhoods,” said Kimber Lanning, Director of Local First Arizona. Some of the businesses featured in the third edition of the Scottsdale Small Wonders map include diverse businesses such as AZ on the Rocks, Kidstop Toys, and Zak’s Chocolate, and also includes returning Scottsdale classics like Frank Lloyd Wright’s Taliesin West, Hotel Valley Ho, and Pink Pony. The third edition of the Scottsdale Small Wonders map features local businesses all over Scottsdale from Bell Road to McDowell Road. This map also features information about nearly twenty public events happening in the Scottsdale area including MIMFest from the Musical Instrument Museum, Arizona Taco Festival, and the Food Truck’s Caravan. Scott Yanni, general manager of popular Old Town Scottsdale Wine Bar 5th and Wine, says he choose to participate in the Scottsdale Small Wonders Map because it shows where the locals go. 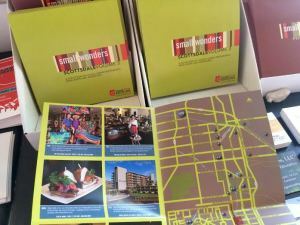 “We chose to participate in the Small Wonders Map because we thought it would be a good avenue to reach a wide range of potential customers,” said Yanni, as the maps are distributed at a variety of locations including hotels, apartments, and other local businesses. Supporters of the Small Wonders map say that connecting residents and visitors to local businesses in Scottsdale results in a variety of benefits for the community. “Local stores help to sustain vibrant, compact, walkable town centers which are essential to reducing sprawl and automobile use”, says Kim Brush, owner of My Popcorn Kitchen, on the far-reaching benefits of supporting local business. Local First Arizona has also produced Small Wonders maps for Central Phoenix, Phoenix’s Arcadia neighborhood, Tucson, the Verde Valley, Gilbert, Glendale, Tempe, and Mesa. The Scottsdale Small Wonders map can be viewed digitally at the Local First Arizona website: http://www.localfirstaz.com/small-wonders/scottsdale.php. Physical maps can be picked up at a variety of local businesses, hotels, apartments, and events in the Scottsdale area. Business owners, realtors, property managers, hotels, event organizers, and individuals can request maps for distribution free of charge by contacting Local First Arizona at [email protected]. Fifty thousand copies of the Scottsdale Small Wonders maps have been printed for distribution, look for them near you!